Last week I watched with sadness a programme on BBC2 called “Kill the Christians”, a ‘This Wold’ documentary looking at Christianity’s greatest threat to its existence in the very place where it was born. 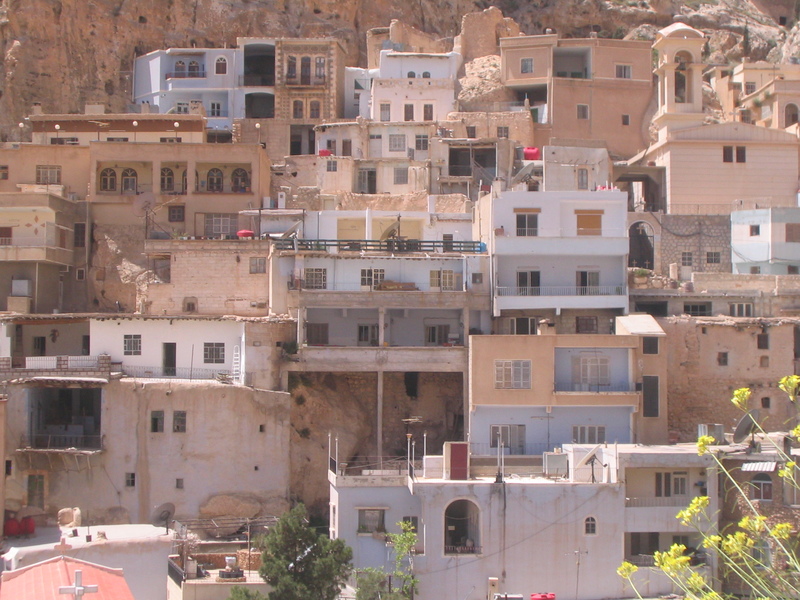 The programme featured the ancient settlement of Maaloula, one of a handful of villages in the mountains northeast of Damascus where Aramaic, the language of Jesus, is still spoken. Today the monastery of St Sergius which looks over Maaloula, and Maaloula itself, lies in ruins after a battle between rebel fighters and Syrian government forces last year. Suzan and Nihad in front of a stained glass of the Maddonna and Child in the Monastery of St Sergius. In 2006 I took a day trip to Maaloula with my sister and other family members because Suzan wanted me to see that religious freedom was still possible in Syria. I always knew that though. In all the years I have been visiting Damascus I have never felt threatened because of my Christian beliefs, not outside the family anyway. But I did want to see Maaloula, not so much for its religious connections as its architectural craziness. Suzan had told me that there houses were built on top of houses and the only thing holding the patchwork of dwellings together, which had been crammed into the mountainside, was the house beneath it. Intrepid trekkers: Nihad, Alaa, Shereen and Suzan. Maaloula is about 40 miles north-west of Damascus requiring about an hours drive. On the advice of my nephew, Nihad, who at 18 yrs old had just finished his National Service with the Syrian Army, I hired a very dubious looking vehicle from from an even dubious looking car hire depot on the outskirts of Duma. True to form the car refused to start the following day after we had snuck out of the house before Suzan’s husband caught us and put the kibosh on the whole trip. For twenty minutes, “Urrrrhhhh, urrrhhhh,” reverberated around the yard as Nihad tried to get the car going. The inevitable happened. Omar came to the balcony to see what was making the racket. Glaring down at us, he ordered us back into the house. Not a chance. The engine was in danger of flooding, if it hadn’t done so already, but still Nihad made one more valiant attempt. The turn hit home just as Omar was emerging from the front door and we sped off, no one daring to look back lest he was aiming one of his guns at us. It was a breathtaking journey through the mountains. But nothing could have prepared me for the beauty of the Maaloula and the marbled rock face it appeared to have sprung from. Centuries of painstaking devotion had gone into creating a habitat that was truly in tune with its environment, religious and domestic, and it took just days for it to be destroyed. It broke my heart to see the desolation of what had been for me a magical place held together on a wing and a prayer. Hats off to the Syrian forces who fought to recapture Maaloula from the rebels that had seized it. Yet greater respect to the hundreds of brave Christian settlers who have returned to their homes, what’s left of them, determined not to be driven from their homeland.